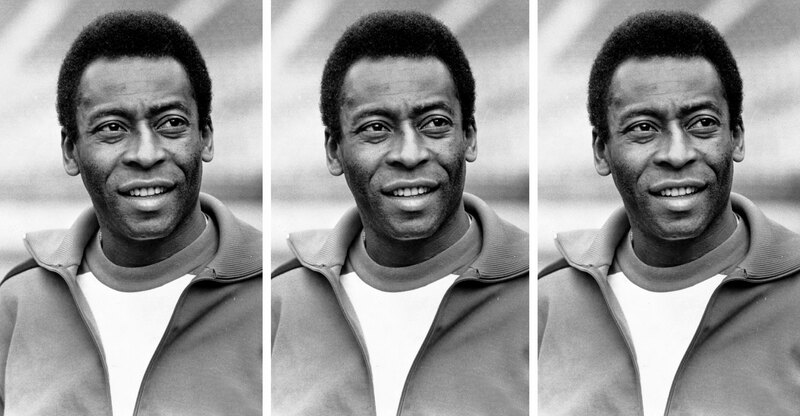 Pelé, when you are the best at something how hard is it not to get arrogant about it? I am not sure if it was only God who gave you that gift. Being at the top of the game must be hard work as well. Of course the work is very, very important. That is exactly what my father meant: God gave you the gift to play football, but this is a present. You must respect people and work hard to be in shape. And I used to train very hard. When the others players went to the beach after training, I was there kicking the ball. Another thing I say is, if I am a good player, if I have a gift from God but I don’t have the physical condition to run on the field what am I going to do? Did you ever feel like your abilities were super-human? No, we are all human beings. I have to trust something that gives me power, I have to believe in something, but in my career I have a lot of moments I cannot explain with God. We went to Africa and we stopped the war in Africa because the people went to see Pelé play. They stopped the war. Just God can’t explain that. I don’t know why – it is impossible to know why – but they stopped the war. When we finished the game and we left they continue to fight. Did you always know that you were meant to achieve big things? The first World Cup I remember was in the 1950 when I was 9 or 10 years old. My father was a soccer player and there was a big party and when Brazil lost to Uruguay, I saw my father crying. I was with all the kids and I said, “Why are you crying?” My father said, “Brazil lost the World Cup.” Then I made a joke and told him, “Don’t cry, don’t cry, I’m going to win the World Cup for you.” Eight years later, in 1958, I was playing for Brazil when we won the World Cup in Sweden. Did you realize what kind of an impact this victory would have on Brazil? At that time nobody had Brazil on the map and suddenly Brazil became a huge football nation. I was very proud because I made Brazil well known all over the world. Now with the new technology, the boys score, run behind the goal and say, “Mommy, I love you,” into the cameras and the whole world can see it. In my time, I think maybe my father saw and maybe he knew we won, but at that time we didn’t have TV, we didn’t have that kind of communication. The game was finished that night and the next day we had to go on the radio in Sweden to talk on the radio in Brazil and say, “Mommy, we won.” You see the difference in the life we have now. I’m never going to forget that. What else changed in the sport of football? The game is the same. But we used to travel all year around to get paid. In January and February we travelled in Latin America, we played and we got paid. And in the summer we toured in Europe and got paid. Now you have the sponsors and the players don’t need to travel. In my time, we gave football to the world. It’s a different approach now. And it was partly because you travelled around that football became the biggest sport in the world. Which is the reason why I could be an example for the youngsters. If I pass away one day, I am happy because I tried to do my best. My sport allowed me to do so much because it’s the biggest sport in the world. Do you think the Brazilian team will win the World Cup on their home soil next year? It’s a game so it’s difficult to say, but I have no doubt that Brazil has the best players. Unfortunately we were with Mano Menezes who was the trainer for two and a half years. What do you think about Scolari, the new coach? Do we have a Pelé nowadays? Who is your favorite player these days? In the recent years, it was Zidane and after him came Cruyff and Eusébio. Neymar is an excellent player but he has to get more experience and play abroad. And of course Messi and Ronaldo are good as well. Messi is the one to beat at the moment, because he’s been the best player for almost ten years. There are a lot of great players but many shine for one year or two years and then they disappear. To have a great player for ten years – this is more important.